Even better when mixed with ice cream. 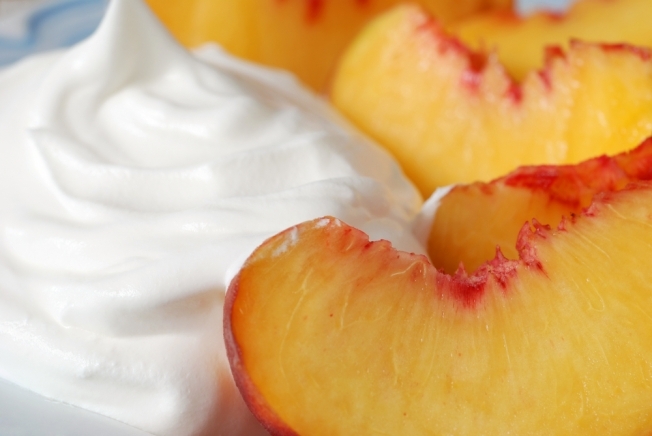 Even though yesterday was National Peaches and Cream Day, you still have an excuse to indulge in a simple pleasure. In honor of the, um, "holiday," Good Stuff Eatery (303 Pennsylvania Ave. S.E.) will be serving peaches-and-cream shakes through the end of June. The chef dices new peaches, slow cooks them over a stove pot, mixes them with homemade custard, and then adds a bit of honey, said Micheline Mendelsohn, director of marketing at Good Stuff Eatery. The shake is then topped with fresh-made whipped cream. Yeah, you're probably on your way to Capitol Hill now. A different blend is featured every month. To mark Independence Day, the restaurant will offer the Red and Blue Swirl: blueberries and raspberries stirred in vanilla custard. A small cup or “Mini Moo” is $4.75 and a larger one goes for $5.25.